Recruitment for the train-the-trainer workshop in Poland! After over a year of hard work and user testing, the New Shores game and its accompanying materials are now available on the Edmodo platform. However, this success does not mean that the work on the project is finished. Our objective for upcoming months is to promote this innovative tool among people working with youth. To assist educators and youth leaders in using the game in their day-to-day work, the Center for the System Solutions in cooperation with Rogers Foundation and TANDEM n.o, organize free, certified train-the-trainer workshops in Poland, Slovakia and Hungary. The Polish edition of the event will take place on October 6, 2018 from 9:00 am to 5:00 pm at the Infopunkt Nadodrze at Łokietka 5/1 in Wrocław. 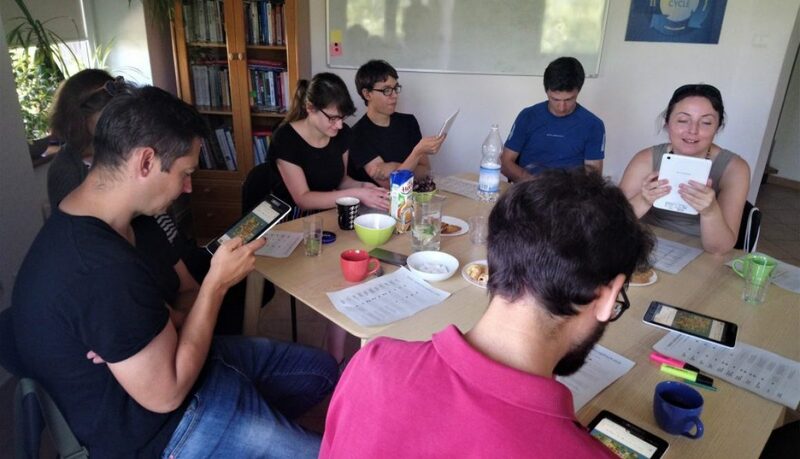 During the training, future New Shores moderators will learn how to create a game, manage its functions and encourage young people to discuss about social and ecological responsibility. You can register for the workshop via the registration form. On September 4, 2018, a last face-to-face meeting took place as part of the New Shores project. 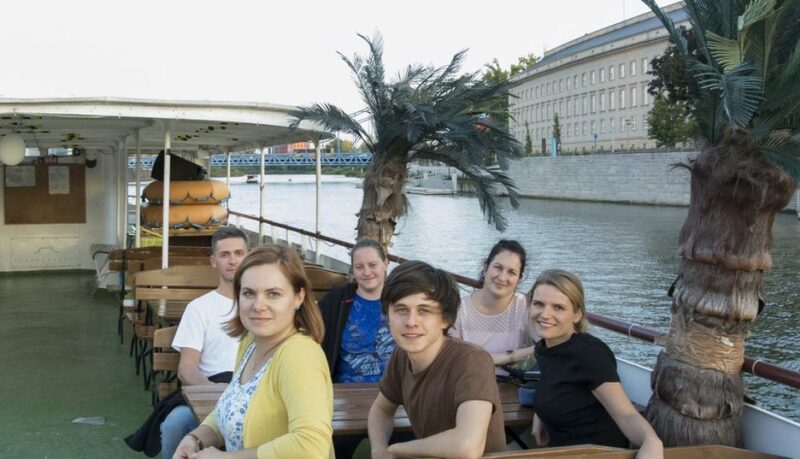 Its main objective was to prepare for the final event – training for future New Shores moderators that will be held in the Autumn in three countries: in Poland, Slovakia and Hungary. Together, we have prepared the schedule of the event, the Polish edition of which will take place in Wrocław on October 6, 2018. 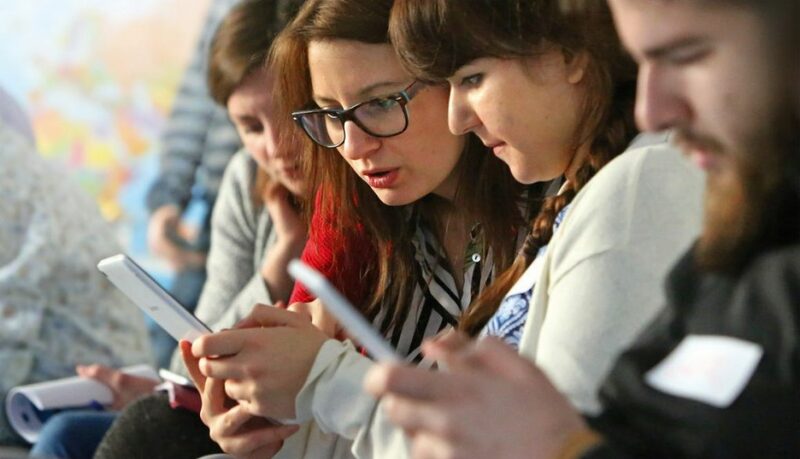 At free training, pedagogues, librarians, activists and other youth workers will have the opportunity to learn how to conduct workshops on social participation, using the New Shores – A Game for Democracy. 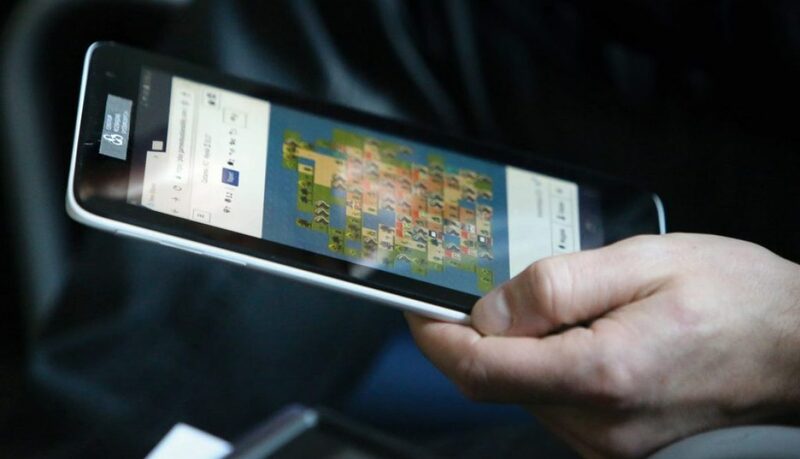 They will also receive free access to educational materials gathered on the Edmodo platform. There are still a few places available for the training – it is enough to fill the registration form available on the project website! Meanwhile, we still don’t say goodbye to our Partners. Although it is our last “live” meeting, there is a lot of joint work online ahead of us! International Day of Democracy, initiated by the United Nations, celebrated its tenth anniversary last year. Held on 15th September since 2007, the event is an occasion to review the state of democracy in the world, highlighting the challenges, responsibilities and opportunities it offers to nations, and examining how well parliaments fulfill their democratic mission, and what can be done to improve their effectiveness. On this occasion Games4Sustainability issued a new post to inspire us to aim for SDG16: Peace, Justice and Strong Institutions by playing New Shores online (to read a full article, click here). If you are an educator or youth leader, you should definitely give the game a try! Register for an open New Shores session on 15th of September at 4 pm CEST (for English-speaking players) or 6 pm CEST (for Polish-speaking players). It is enough to send an email to the address: aleksandra.solinska@crs.org.pl. In response, you will receive a return e-mail with all necessary information. To see who else is going to participate in the game session, join the FB event. 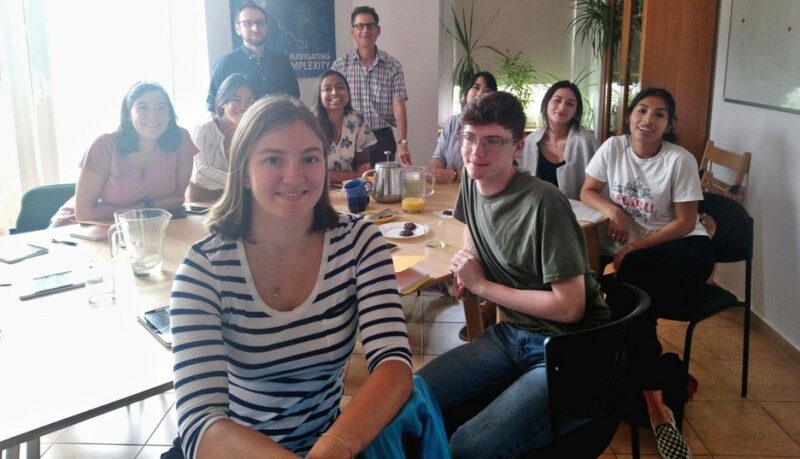 On August 25, 2018 we had the pleasure to host a group of students from Syracuse University in New York, USA. Visiting Central Europe as part of “The European Identity Seminar”, they began in Berlin, Germany moved to Wroclaw, Poland and then Vienna, Austria. In each of the countries, they explored the multilayered nature of #cultural and political identity of this region, shaped by, i.e. the two world wars of the 20th century and a relatively recent transition from #communism to #capitalism. 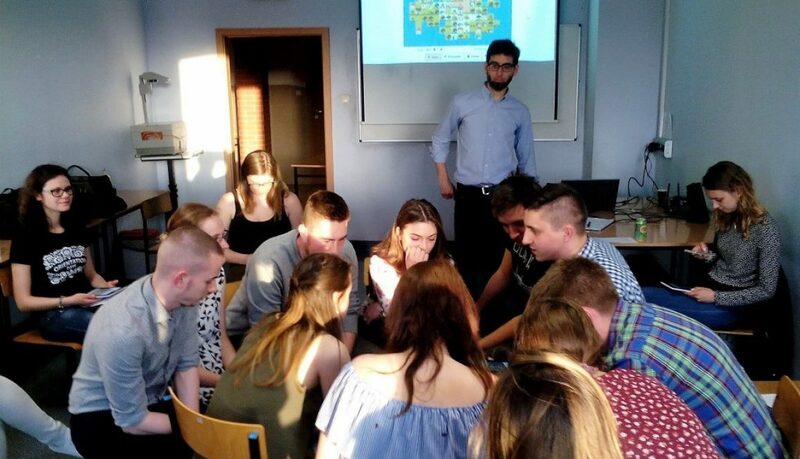 During the visit in Wrocław they had an opportunity to play New Shores – a Game for Democracy that touches upon similar topics, triggering discussion on the state of #democracy and ways we can strengthen its position within Europe and beyond. Thank you, guys for your good energy. WE had a lovely time! The October workshop for future moderators of the New Shores – a Game for Democracy is to be launched soon (you can already register for the free meeting). Meanwhile, as part of the preparations, we organized an open face-to-face game session for people interested in getting to know this tool better. During a two-hour meeting, the profession- and age-diverse group (academic researchers, high school students, facilitators and NGO employees) did not only play the game, but also lively discussed its educational potential. The brainstorming process helped us clarify the most important issues that we would address during the October workshop. We don’t know about you, but we have a feeling it’s going to be a memorable event! On June 5, 2018, on the occasion of the World’ Environmental Day, we held an open New Shores online session. A world in which individual and collective motivations of the players do not always go in line with the overarching goal of the UN initiative, has become a witness to a truly exciting gameplay. Academic teachers and sustainability professionals from England, Greece, Italy and India entered the roles of residents of the mysterious New Shores island and strove to manage common resources in a way that would promote economic and social development without compromising the environment. As they admitted after the game, it was not an easy task: “The New Shores is an important educational experience that highlights the interplay between social, environmental and economic dimensions of sustainability and how personal interest and well-being can undermine collective decisions and strategies” – said Mrs Vasiliki Kioupi, PhD researcher at the Centre for Environmental Policy of Imperial College London. We are happy to announce that on May 31, 2018 we finally launched the New Shores class on Edmodo! 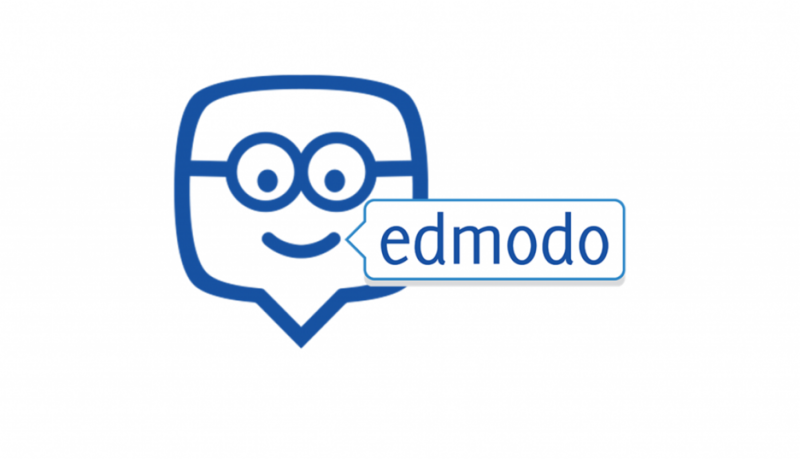 Edmodo is a global education network that helps connect all teachers with the people and resources needed to reach their full potential. It works a little bit like a social media site with teachers being able to start discussions, posting pictures, uploading and sharing useful resources and exchanging information. 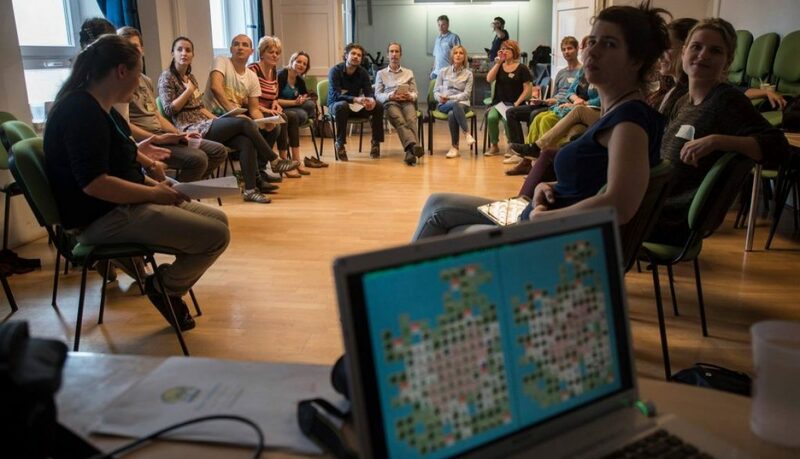 One of our main objectives in developing New Shores – a Game for Democracy was to activate both educators and youth, and to create space for a lively international dialogue. It wouldn’t have been possible without the game and its accompanying materials being easily accessible to people from all around the world. This is why we decided to make use of Edmodo platform and disseminate the results of our work as widely as possible. How can access New Shores’ materials on Edmodo? Edmodo’s classes function like a storage of all interesting text, visual and audio-visual materials. New Shores’ team has created actually 4 such classes in English, Polish, Slovak and Hungarian. They all share the same structure of a 9-step online course that will guide you through the New Shores workshop preparation, organization, moderation and conclusion. Each section contains useful texts and videos that will help you adapt the game to match your class and your preferred facilitation style. You don’t have to be an expert neither in IT nor in democracy to lead a successful game session with your learners. 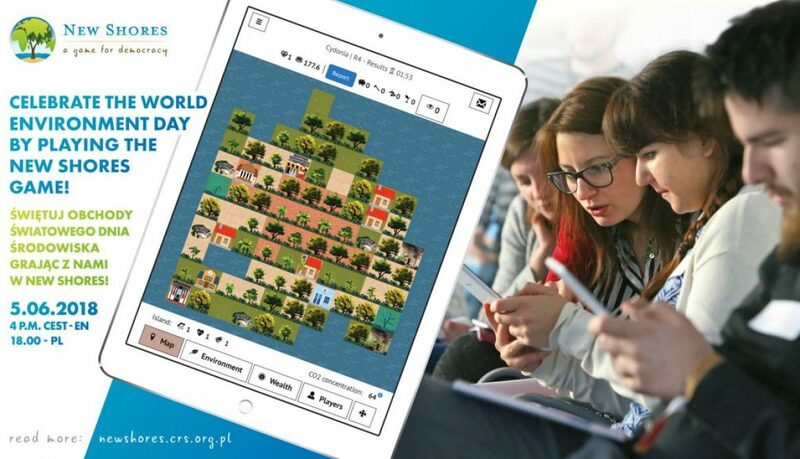 And what is more, you can do it completely for free because both registration to Edmodo and access to the game and its accompanying materials are free! Decide what language class you want to join and follow the registration steps provided in one of the documents; in English, Polish, Slovak or Hungarian. Follow the 9-step course on Edmodo or at least download and read Moderator’s instructions (to learn how to log to the game’s panel and start a game) and the Workshop scenario (to find out how to turn the game into an exciting educational experience for your students) available in the section Full Materials to Download. Use Edmodo’s Forum to share your impressions after the workshop or post photos of your student’s assignments (posters, projects, etc.) in the Call for Action section. You may also evaluate the whole course in the section Evaluation. Is it still not enough? Spread the word and invite new teachers to New Shores’ class. Let’s build a strong network of New Shores users to make education on democracy and sustainability more attractive to youth! Since 1974, the 5th of June has been celebrated as the World Environment Day. An important date in the calendar for those who value the nature, the World Environment Day is a time to stop and reflect on how we are part of nature and how we directly depend on its ‘ecosystem services,’ such as clean air or drinking water, greenery and fertile soil. What can we do to make people more aware of the environmental issues? Games4Sustainability published a new post about the role that social simulation and serious games, like New Shores game, play in shaping the attitudes of youth. Visit the Games4Sustainability to read a full article! You can also join the open online session to check the game for yourself. Join the FB event here for more details. We visited the Wrocław University of Economy to participate in this year’s edition of the Szkoła Liderów Lokalnych! A group of 19 students of economics took part in a short presentation about activism, voluntary work and social cooperatives as well as nongovernmental organisations and the emerging 4th sector. The presentation was followed by a session of the New Shores game, which sparked vivid reactions. The participants of the simulation praised its realism and the challenging nature of the tasks they faced on the way to the common #sustainable future. The workshop was moderated by Jakub Damurski and Władysław Zołoto. 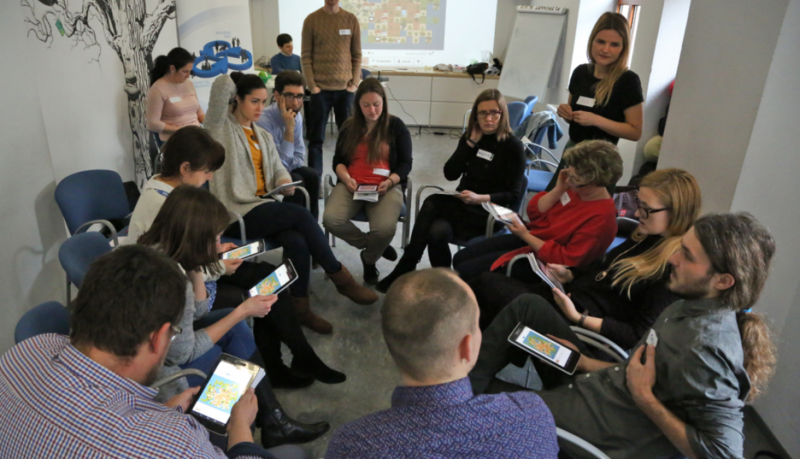 Last Thursday, we met with educators, lecturers, librarians and other youth workers to test New Shores – an unusual game that aims to bring the topic of participation, cooperation and making sustainable decisions closer to young citizens of Europe. Is is possible to use a game to encourage young people to ask themselves difficult questions, and even better – to transform their ideas into action? These and other questions were raised during a heated discussion after the game. We would like to thank all participants for your valuable comments, Ekocentrum for hosting us at their premises, and Wilk Syty for delicious, vegan catering. The project is being developed in cooperation among Centre for Systems Solutions, Rogers Foundation and Tandem n.o. and is funded by the EU under the Erasmus + programme.